Oak Furniture Land, the UK's largest retailer of solid hardwood furniture, has opened a branch of its specialist Sofastore arm in Rotherham, creating seven local jobs. Taking on half of the unit vacated by Staples at the Foundry Retail Park in Parkgate, Sofastore showcases the full array of the company's sofa ranges which includes over 75 different ranges of high quality sofas, with a huge selection of colour and size variations to choose from, along with a selection of solid hardwood furniture. Plans were approved last year for the creation of a mezzanine level inside Unit 6 to create extra space, increasing to a total of 1,100 sq m (11,900 sq ft) of floorspace. The Wiltshire company has sustained remarkable growth in recessionary times and now operates 57 show rooms throughout the UK. With a business philosophy based on designing its own products and working direct with manufacturers, Oak sells large volumes of high quality oak, mango and mahogany furniture at internet prices. Last year sales increased 77% to £145.5m and this year they are forecast to exceed £190m. 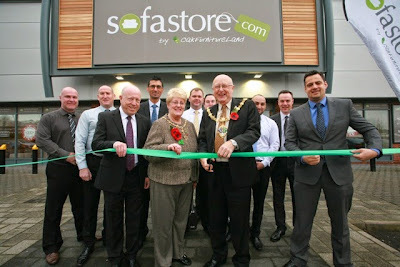 Steve Knight, regional manager at Sofastore, said: “We are pleased with this latest addition to our estate. It’s a major investment, and plays a significant role in our on-going store opening programme across the UK, which will see us opening a store each month for the next three years. So far we have created over 350 jobs nationwide." The Mayor of Rotherham, Councillor John Foden, who officially opened the store, added: "The new store is a welcome investment to the area, and is a nice addition to the choices of shops for local residents." The park was acquired by Brockton Capital and Pradera for around £22.1m in 2012. Recent lettings include The Range and B&M Bargains with Danish retail giant, JYSK, opening in the former Dreams unit earlier this year.